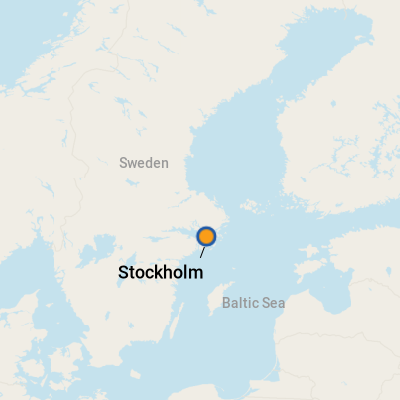 Named in this century as both Europe's Cultural Capital and also the continent's first Green Capital, Stockholm is the largest city in Scandinavia, with about 1.8 million residents in the metropolitan area -- about one-fifth of Sweden's total population. The city, founded in 1252, comprises 14 islands, and is a popular port of call and turnaround port on Northern Europe cruises. Stockholm's premier tourist attraction is Gamla Stan (literally, Old Town), one of the largest neighborhoods of 16th-century buildings in Europe. Block after block of these four- and five-story structures are painted in vivid colors typical of Mediterranean villages and occasionally feature wrought-iron signs symbolizing ancient craftworkers' guilds or faces of religious figures. Cobblestone streets and arms-width alleys criss-cross Gamla Stan. There, you'll also find the 18th-century Royal Palace atop the crown of the hill upon which Gamla Stan is located. (Sweden is a constitutional monarchy and has a one-house parliament). Boulevards defining Stockholm's busy waterfront are also lined with photogenic architecture -- turrets, spires, stucco patterns -- mostly dating from before the turn of the 20th century. Elsewhere downtown, glass-and-steel retail centers and office buildings have replaced such older buildings. But the divergent styles tend to be clustered and don't compete with each other for the viewer's eye. Offsetting the city's bustle and buildings are large swatches of green space. The Ekoparken, or eco-park, curves for six miles through a couple of the busiest islands and along one side of the downtown business district. A word to the pennywise: Stockholm is expensive. Especially if you're spending time there pre- or post-cruise, a best-bet is the Stockholm Card, which provides automatic admission to about 80 museums and attractions, plus passage on buses, trams, subways and some ferries. Presuming you are in the city long enough to use it for some of the museums, it's easily worth the $65-$70 (about £40) charge for a one-day card. Buy it online before leaving home. Two cruise ports serve the city, though the one at Gamla Stan -- reserved for smaller ships -- is far more convenient for shore excursions. The site for larger ships, Frihamnen, is about a 15-minute cab ride (or step aboard Buses No. 1 or 76) from the heart of downtown. If your ship docks at Frihamnen, leave ASAP. Except for the contemporary art museum Magasin 3, in a converted warehouse, this bland industrial area has no attractions for tourists. The port is used most often as a terminus for ferries crossing the Baltic Sea. While there is a souvenir shop and free Wi-Fi in the cruise ship terminal, there is no Internet cafe nor ATM; however, the ferry terminal, about a five-minute walk from the cruise terminal, does have an ATM machine. To reach a more charming part of Stockholm, grab a cab just a few yards from your ship or, slightly farther on, board buses near Magasin 3. If your vessel docks at Gamla Stan, you will find museums, the 600-room Royal Palace, cafes, trinket shops, ATMs and banks, all just minutes' walk from the dock. Visiting Gamla Stan means you'll be treading on cobblestones. Leave the high heels and the flimsy sandals back on the ship. To save a few kronor, avoid meals in the most-touristed areas, where price inflation is common: for instance, $27 for a small plate of Swedish meatballs. On the plus side, pickpockets and petty crime are not common in Stockholm. You can explore Stockholm by electric trolleys (called tram), buses, ferries, the subway and on foot. The city is very walkable, with many of the prime tourist destinations within a couple of miles of one another. Taxis do accept credit cards, which is a plus because cabs can be costly; for example, a ride from Frihamnen to the city center -- near the main train station and central subway hub -- will cost about $25. Remember, though, that you can use your Stockholm Card on public transport. Just step aboard the bus or tram, and show it to the driver. Another option is to buy a ticket for the daily hop-on/hop-off bus. Tickets are good for 24 hours and come with a map noting various attractions and their bus stops; you can leave the bus and pick it up again at any of its stops. City Sightseeing offers both a bus-only and bus/boat option, and passengers can board the buses at Frihamnen, among other stops. Finally, environmentally friendly Stockholm has a municipal bike-rental program that's convenient. Buy a three-day card online, at your hotel or at the main tourist office at Vasagatan 14. Find one of several dozen automated bike racks, which operate from 6 a.m. to 10 p.m., and scan your card, which will delete credits and unlock a bike for you. Ride it where you want, for up to three hours, then return it to any of the bike racks. North American and European flights use Stockholm's sleek Arlanda Airport. It can be reached by the Arlanda Express train in just 20 minutes (some days the train offers two-for-one fares), by the direct bus known as Flygbussarna and by cab. The train and bus arrive at the Central Train Station. Rental cars are available at the airport. The Swedish krona is the unit of currency. For up-to-the-minute rates check www.xe.com or www.oanda.com. Denominations of paper krona are 20, 50, 100 and 500. Amounts below 20 krona are settled with coins. ATMs are abundant in the city, as are currency-exchange shops, most prominently the company named Forex. Occasionally there are ATMs immediately outside Forex offices. Banks will also exchange currency. Officially, it's Swedish, but English is a mandatory subject for several years of school, as is a choice of a third language. (French and German are the favorites). Consequently, workers in areas frequented by visitors speak more-than-adequate English. There probably are three constants in Swedish meals -- lingonberries, open-faced sandwiches and pickled herring. Expect to find the tart berries, or sauce made from them, next to or on top of numerous entrees and desserts. Herring is served marinated in onions, garlic, dill and mustard, and is typically accompanied by boiled potatoes and bread. As for the sandwiches on one thick slice of bread, expect the toppings to range from herring to shrimp -- a favorite -- to game like reindeer and boar. Swedes love baked goods, especially during their coffee breaks. A colorful favorite is the princess cake: layers of sponge cake separated by jam, custard and whipped cream, topped with icing in brilliant colors. For more than 30 years, the Vete Katten (literally, wheat cat) has drawn Stockholmers for their daily fike -- a ritualized coffee break. Vete Katten in central Stockholm is a bakery and cafe, offering multilayer, multiflavor cakes, sweet rolls (cinnamon, vanilla, almond, fruit, etc. ), small sandwiches and salads. (Kungsgatan 55. Open Monday through Friday, 7:30 a.m. to 7:30 p.m.). At the Ostermalmshallen (Food Hall) downtown, set in a vast but handsome building that opened in 1888, vendors still offer the freshest seafood, meat (including reindeer and moose), produce, cheese and chocolate. Locals also head there for its 10 restaurants and delis. (Open Monday through Thursday from 9:30 a.m. to 6 p.m., Friday from 9:30 a.m. to 7 p.m., Saturday from 9:30 a.m. to 4 p.m. Try a museum cafe when you want a bite to eat in the middle of your sightseeing. A perfect spot to relax after visiting the Vasa Museum and its multiple floors of exhibits and viewpoints is its fairly large dining room. Freshly made sandwiches, salads, yogurt, a few hot entrees and desserts are served buffet-style; you can even get beer or wine. The fare is simple, but the waterfront view, indoors and out, makes it seem special. Speaking of dining room panoramas, you can't do better than the Operakallaren, the restaurant in the grandiose Royal Swedish Opera House. The menu is haute cuisine: foie gras, fried quail, saddle of venison. It all comes with a view of the busy harbor. (Open Tuesday through Saturday, 6 p.m. to 10 p.m. Royal Opera House, Jacobs Square 2). Prinsen lacks such views; now in its second century, the restaurant is on a side street off a commercial boulevard. But contemporary prints, rich wood furnishings and leather chairs lend a clubby air, and its menu offers traditional Swedish fare, such as bigg rydberg (cubes of filet, onions and potatoes) or five kinds of herring, served with potatoes and cheese. (Open Monday through Friday from 11:30 a.m. to 11:30 p.m., Saturday and Sunday from 1 p.m. to 11:30 p.m. Master Samuelsgatan 4). The island of Sodermalm was once a working-class residential area, and a few remnants of those times still remain. Among them is Pelikan, an understated restaurant that specializes in old-time Swedish cuisine and a variety of beers. This is a prime spot to taste meatballs in cream sauce (a Swedish tradition), fried herring, and potato dumplings stuffed with wild mushrooms and served with -- what else? -- lingonberries. (Open Monday through Thursday from 4 p.m. to midnight, Friday and Saturday from 1 p.m. to 1 a.m., and Sunday from 1 p.m. to midnight. Blekingegatan 40). On the low end of the look-where-I've-been scale, go with a T-shirt that proclaims simply, “Stockholm/Since 1252.” For those visitors more fashion-conscious, the Swedes are famed for their decorative crystal and glass pieces for your desk, bookshelf or table centerpiece: Kosta Boda and Orrefors are the best-known names. More recently there has been an emphasis on clothing design; if you want to be able to tell friends, ”I picked this up in Stockholm,' head to trendy department stores Ahlens City or NK (in its second century) or the store operated by fashion maven Anna Holtblad.